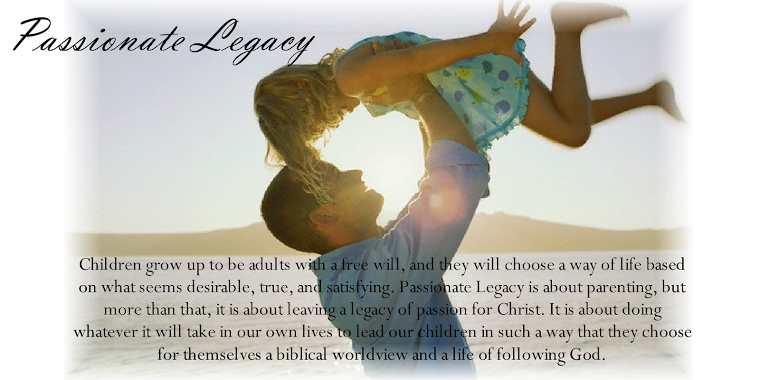 Passionate Legacy Principle #1: Be a desirable example of godliness so that your children will choose it for themselves. Children grow up to be adults with a free will. They will choose a way of life based on what seems desirable, true, available, and satisfying. We need to win them over the way we win over any non-believer. What do your children think of your Christianity? Would they say your Christian life is boring or exciting? Would they say your Christianity is busywork or passionate purposefulness? Are you living your life in such a way that your children will want to follow in your “spiritual footsteps”? When most of us first came to Christ, we were on fire for the Lord and passionate about our faith, but after a few years we became comfortable and lazy. We begin to surround ourselves with “safe” Christian friends who protect us from temptation. They become so much a part of the formula for our success that they ended up substituting for the power of Christ at work within us. Our contact with the unbelieving world became more accidental or professional rather than deliberate. At first we were excited about studying the Bible to know Jesus more, but as the years passed we began to study the Bible to know the Bible more. Church was at first a place to go to get healing, but later become a place to hide from the world. It became a place to relax and catch up with friends, rather that a place to prepare and re-energize for our next adventure into the spiritual battlefield of the “soul harvest” of the world. At first, we did ministry because we were so excited about our relationship with God, and we wanted to share that. But later, it became just what was expected of us. It became reluctant, redundant, and boring. Our children witness that change. When they don’t see genuine passion in us or in our spiritual activities, that invalidates everything they are being taught about how to have a passionate relationship with Jesus Christ. It is easier to live off the past victories of our faith, and remember how great it was when we gave up sin or led someone to Christ, than it is to continue to fight in the daily spiritual battle for lost souls. But the problem is, when we don’t stay engaged in spiritual combat, we get rusty and old and out of shape and all of our passion fades away, leaving us just going through the motions. If we want our children to want a relationship with Jesus we will have to show them that it is something worth having. We have to show them that Jesus Christ is active and powerful, and that His word is true. And we have to show them that being in a relationship with Jesus is satisfying our spiritual needs. We have to show them that we are involved in something that is worthwhile. We will have to live with purpose and with passion. If being a Christian is reduced to following rules, going to church and serving in ministry, all out of obligation, it is not a desirable way of life and our children will find another way. Are you bringing your kids to church to be safe from the bad things of the world or to learn to make a difference in the world? Are you engaged in spiritual combat? Are your children learning that they need God only when things are going bad? Have you lost your initial enthusiasm and passion for Christ? Have you tapered off on the spiritual disciplines that you participated in when you were a new believer? Are you taking credit for the fruits of your good, moral life by forgetting that God is the One who gives all good gifts, and that none are deserved? Are you involved in a lot of Christian activities because that’s just what Christians do, or are you involved with passion in what God is doing? In your personal Bible study, are you getting to know the Bible or Jesus Himself? Is the power of your Christianity based on your church friends and moral behavior, or God himself? What can you do or change to follow God with more passion? Our goal is to make Passionate Legacy as practical and applicable as possible. To do that, we need to hear about your questions, struggles and sticky situations that you find yourself in as a parent. If you are dealing with a difficulty, then chances are there are many other parents out there who are dealing with the same thing. We invite you to email us your questions and quandaries so that we can highlight them in future posts - don't worry, we won't print your name or identifying information, or embarrass you in any way. We simply want to address the issues that you are dealing with right now. So, join in the conversation and let's hear from you today. Use the link to the right under "Contact Us".